If you have oily skin and are still looking for the right kind of foundation then this is it! This small list will help you narrow down the brands which are effective and affordable. They can be carried in your travel bags as well so the packaging as well is pretty cute. If you have combination skin, then too these foundations are useful. Let's get started. This is rather easy to apply. It is quite smooth and enriched with vitamins and silicones to improve the natural structure of your skin. It has ground pigments which gives out high coverage and a flawless velvety matte finish all day long. Super affordable for sure, this foundation is waterproof, non-oily and controls Sebum to give your facial skin a flawless matte finish. The only drawback is that it comes in just two shades, i.e cream beige and natural beige. Buy Blue Heaven Oil Free Foundation (Pack Of 2) here for Rs 150. It lasts for hours and gives you full coverage. This amazing foundation is super blendable and very lightweight on the skin. The shade palette is what impresses you as well. There is something for everyone. This baby gives a naturally flawless finish with no caking and has micro-fine pearl particles which help in giving instant correction on the skin. It also contains glycerine, vitamin B and E, nourishes and protects skin. It contains SPF 17 and is available in 12 shades. Buy L'Oreal Paris True Match Super Blendable Liquid Foundation here which is originally priced at Rs 799 but you can buy it here for Rs 516, depending upon the shade. This lightweight foundation mattifies and refines pores and leaves a natural, seamless finish. Ideal for normal to oily skin, our exclusive matte foundation formula features micro-powders to control shine and blur pores. 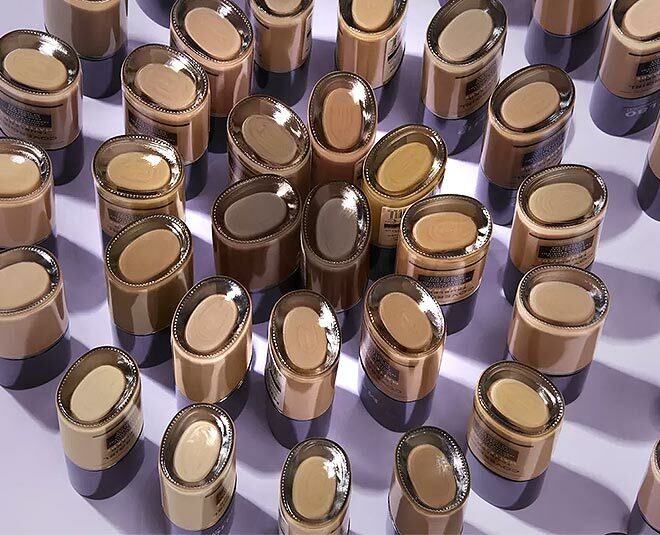 It is available in 16 shades appropriate for the Indian skin tone and the coverage is very much buildable. It refines your pores too give you that perfect, natural matte finish. This one is a favourite of many of us. Very much affordable, you can buy Maybelline New York Fit Me Matte + Poreless Foundation here which is originally priced at Rs 500 but you can buy it here for Rs 337. This has Spf 8, is feather-light texture and stays for up to 16 hours. It is available in 6 different shades to suit all skin tones and if you have combination skin, you can mix it up with some face oil and then apply. Simply divide your face into dry and oily skin patches. Buy Lakme Absolute Skin Natural Mousse here which is originally priced at Rs 750 but you can buy it for Rs 563, depending upon your shade. Don't Miss: Buy These Long Lasting Body Mists Under A Budget! This foundation has many hearts since the day it was launched. It gives coverage which lasts the whole day and has saturated colour pigments which provide an ultra-transforming effect in this long-lasting foundation. It is lightweight, yet high-impact coverage formula which glides onto the skin for a flawless makeup finish that lasts all day oil free. It does not clog pores and is dermatologist tested. The only tip I would give here is that you apply it quickly as it drys up fast. The best applicator is always the fingertip. But you can use a blender or a brush as well. Buy Maybelline New York Super Stay 24H Full Coverage Liquid Foundation here which is originally priced at Rs 750 but you can buy it here for Rs 568.